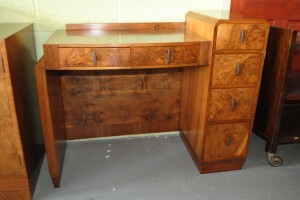 A lovely walnut console that was previously used as a desk but could have many different purposes. The drawers are great for storage and its a good size, possibly a hall table or a sideboard? In very good condition with nice detail and handles. For more details please call 01257 473688. 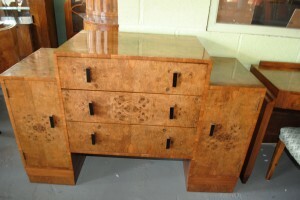 An original art deco walnut sideboard/buffet that is in very nice condition and very handy for storage with the two cupboards that step down at each side and the drawers in the centre with the felt lined cutlery compartment at the top. The Rocket cabinet, iconic English Art Deco design at its best. 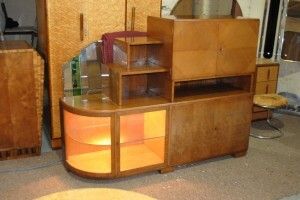 This one is in very good original condition finished in English walnut veneer with Bakelite handles. For more details please call 01257 473688. This is an original and very unusual piece with a curved glass corner to one side and stepped detail above which leads across to the mirrored and maple drinks cabinet at the top. The maple interior throughout including the bottom storage cupboard can also be seen through the glass display which is lovely and compliments the walnut exterior. There are lights in both the glass display corner and top cocktail cupboard. Sitting in the middle above the open section is a pull out mixing tray. This piece will be stripped and polished before delivery. 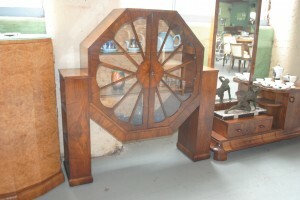 An original art deco octagonal walnut display cabinet with internal light and glass shelves. In very nice condition and a great shape. For more details please call 01257 473688. An original art deco walnut display cabinet with lovely u shape base and internal light, perfect for showing off your collection and In good condition. For more details please call 01257 473688. 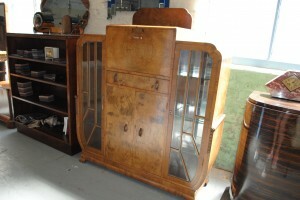 A lovely original art deco walnut veneer cocktail cabinet with glass doors and shelves at each side and handy storage cupboard and drawer to the centre. The top section pulls down to reveal the mirrored cocktail bar interior and glassware. This piece will be completely stripped and re-polished before delivery to bring it back to its former glory. This is a top quality piece, incredibly well made and super heavy. For more details please call 01257 473688. 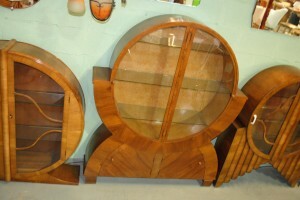 An original art deco circular walnut display cabinet in very good original condition with three internal shelves great for displaying. This shape is lovely and very desirable. For more details please call 01257 473688. 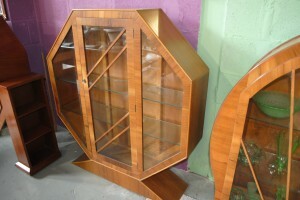 Art Deco Walnut Display Cabinet – Octagonal Spider Piece! Original Art Deco Spider cabinet with Octagonal Display Centre, shelves to both sides and beautiful veneers inside and out! 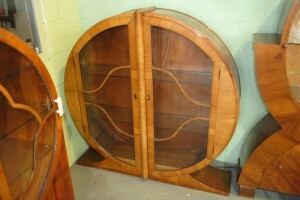 A great original art deco walnut display cabinet with walnut inside and out, the veneer is lovely. 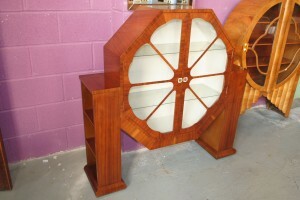 With shelves to each side as well as within the octagonal centre, this is a handy piece. In very good condition. For more details please call 01257 473688. 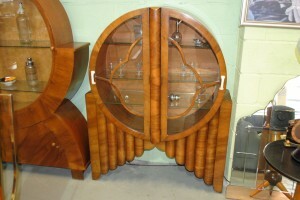 A fantastic original art deco walnut veneer cabinet with lovely circular display top and very handy cupboards at the bottom. This is an unusual and imposing size, shape and design in beautiful condition. 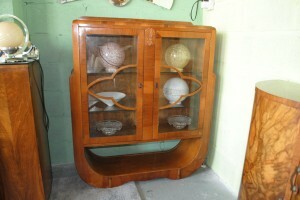 An original art deco walnut spider cabinet with useful shelves at either side. Clean white interior and glass shelves. For more details please call 01257 473688. 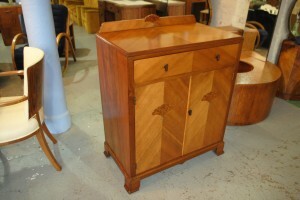 An original art deco cupboard with handy drawer at the top and shelves to the bottom. It has a fabulous and unusual combination of quartered walnut veneer, thuya burl cloud detail, mother of pearl inlay and rosewood handles. The piece is in great original condition and labelled Bowman Brothers, Camden Town.